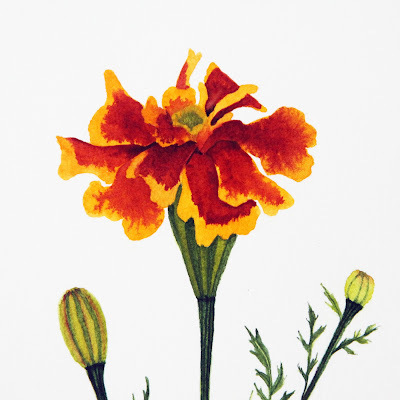 I recently painted some marigolds from my garden. They're one of the few things that are still going strong. Although we've had a few nights below freezing, they haven't been affected yet. And ended up as huge, sprawling plants filled with flowers. It's funny how some plants take off in the garden (the lantana I shared on Monday is another one that just kept going all summer long) and other plants never seem to do much at all. It's different every year. Last year's marigolds weren't as nice as these. I guess it's no surprise that with an abundance of marigolds in the garden right now I'd choose to paint them. I love the ritual of mixing paint, sketching and testing out my colors in my sketchbook. My paint is always too wet to work with when I first mix it and so I work in my sketchbook instead. In my watercolor sketchbook I like combining drawings with paintings while also seeing how the paint I've mixed will look on paper. The painting itself was an experiment. I was testing out some new (to me) watercolor paper by the company Sennelier. I use their pan watercolor paints (along with two other brands) but had never tried their paper. I liked the long, thin shape of this block and thought it would be fun to create compositions to fit within that space. I don't often use hot press paper, so this was an experiment on a few levels. Hot press paper is very different from cold press, and every brand has variations. This paper is very, very smooth with no noticeable tooth at all. I have two other hot press papers that I want to experiment with and of the three this is the smoothest of all. It took some getting used to, but I let the paint do its thing, let it teach me. And I fully enjoyed the process. I bet by this point you're wondering about that confession. I don't generally like to share my mistakes. Nobody does, do they? Well, I made a big mistake with this painting. It was simple carelessness. 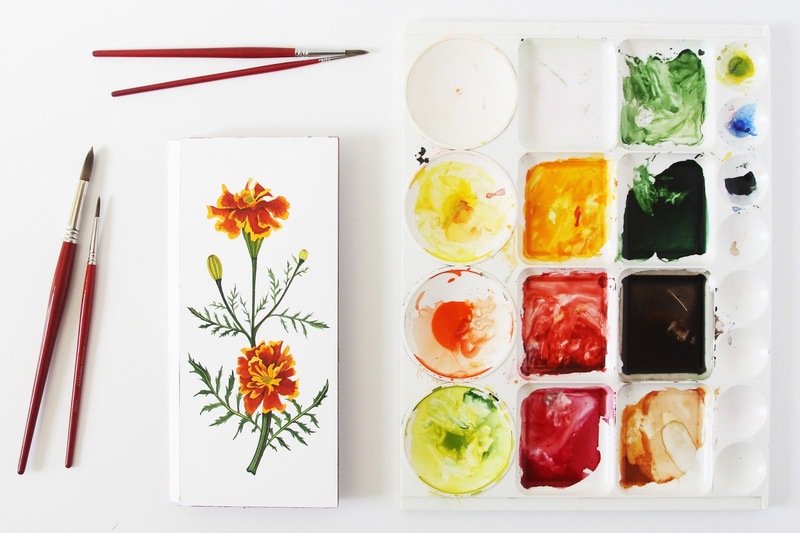 Something similar happened when I was painting the nasturtium flower in my Skillshare class. I thought about re-filming the Skillshare class, but then realized that sharing mistakes and sharing how to deal with them is a good thing. Pretending that I create effortlessly and without doing dumb things like letting a paint-filled brush roll onto my painting doesn't tell the whole story. It doesn't give a realistic picture of what art-making is like. Beginners get frustrated when mistakes happen. I know I did. When I was starting out those mistakes would make me throw away a painting, but I didn't need to do that. 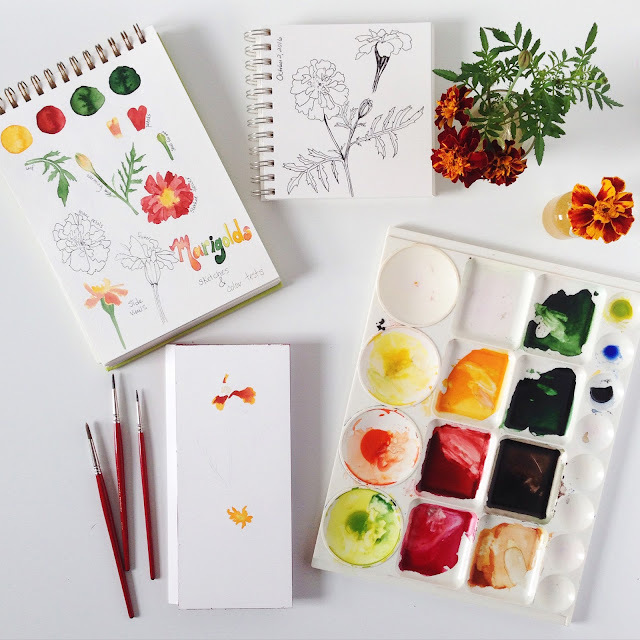 A couple years ago Holly Ward Bimba (aka Golly Bard) shared a painting mistake (and her fix) on Instagram and it struck me how inspiring that was. How brave. How honest. When I work with watercolor I always let one area dry before working on any of the areas that touch it so that the paint stays where I want it to stay. 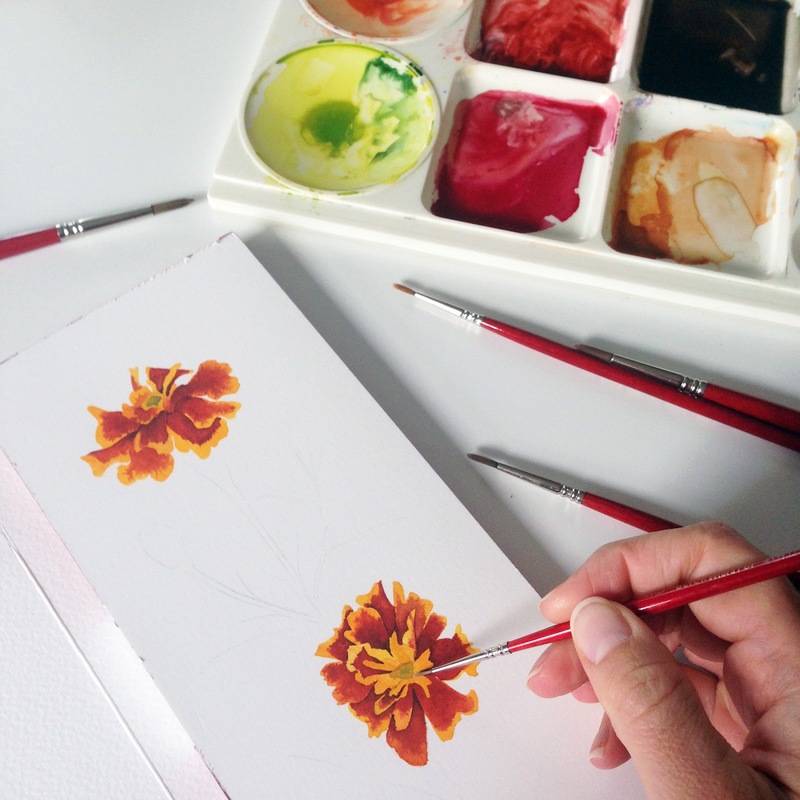 For example I'll work on one petal and let that dry before painting any petals beside it. Often I'm working on a couple areas of the painting at once while I'm waiting for paint to dry. (Some people like to use a hair dryer to speed up the drying process, but I prefer to let the paint and paper and water do their thing naturally). Working like this I need to pay attention to the wet areas, being careful that I don't accidentally set my hand on or smudge the wet paint. I'm sure you can see what's coming. I'd just put the first layer of paint down for the little flower bud on the right when I brushed against the paper with my pinky. In the finished painting there's no trace of that mistake, but believe me, it was ugly. I worked swiftly, blotting the page with a dry paper towel and then wetting the page and blotting some more. This didn't get up all of the stain and so the bud in the final painting is a little fatter than the bud I'd planned (I extended it to the right a bit), but I'm happy that I was able to save the painting. Never give up. We can learn from and fix our mistakes. Slow down. They're all good lessons to learn. I hope your weekend is lovely, slow and free from mistakes! 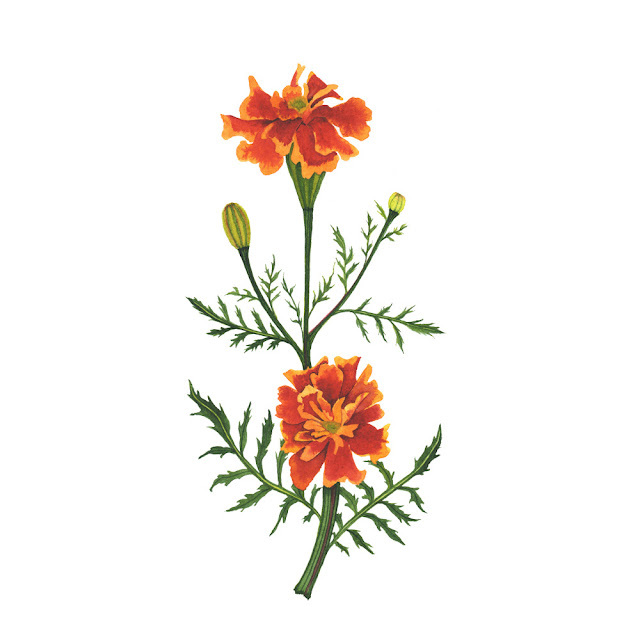 By the way, these marigolds are now available in my shop. I love this work. When you first shared it on IG I fell in love. 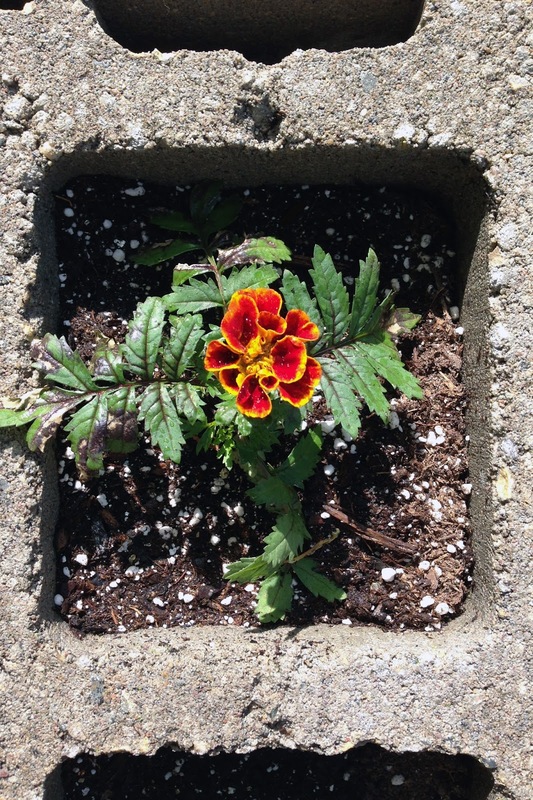 You captured the true color of the marigold. I love to use them in my Autumn bouquets. Thank you, Carla! It was really fun to do. 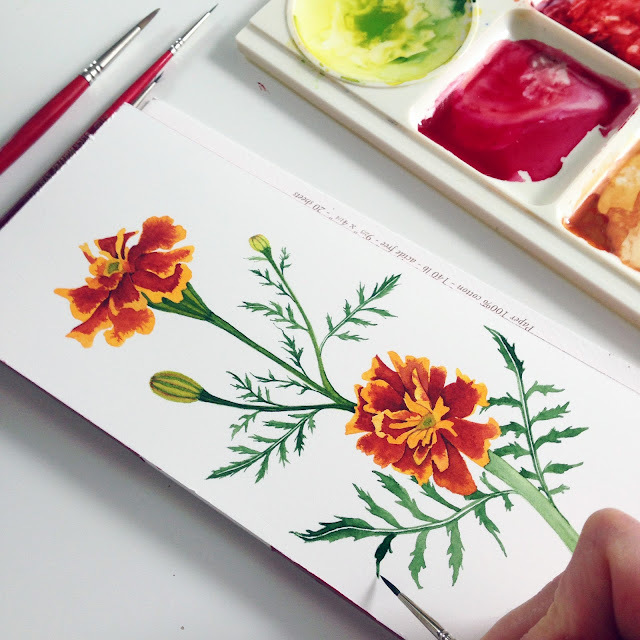 I love painting flowers and plants that might seem kind of "common". Each is special in its own way. So pretty! 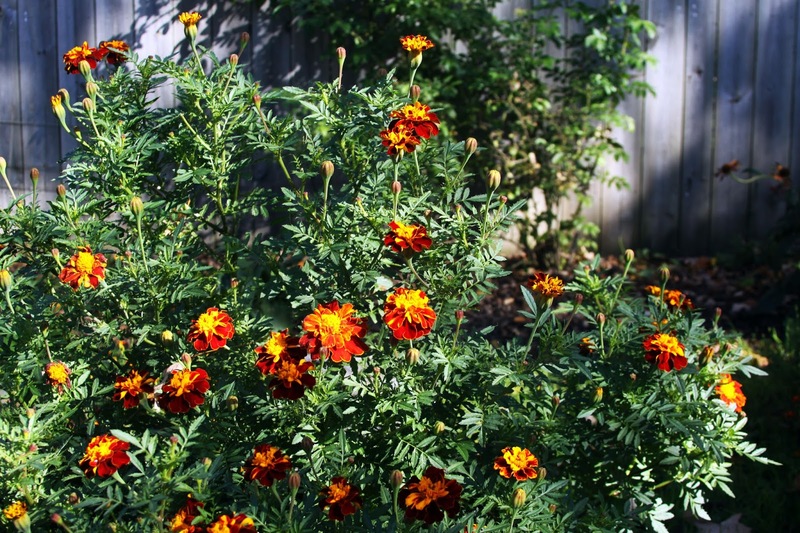 I just planted some marigold seeds yesterday. Weather is changing here in the desert and winter is our growing season. Hoping my little seeds grow. Have a great week. Thank you, Tammy! It's hard for me to think of winter as a growing season; it's so desolate here. I hope your marigolds are lovely! Yes, that's often when mistakes happen. Or when I'm in a hurry, or so engaged in what I'm doing I forget the rest of the painting (that's what happened here). I'm glad I was able to turn it around.